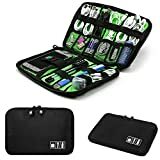 2.Excellent protection:The small electronic organizer pouch is well padded semi flexible covers offer excellent protection for your electronic accessories. 4.Easy to carry: The electronic accessory organizer is lightweight and spacious designed greatly can carry everything you need when you are on the go. Perfect size easily fits into your briefcase, luggage, backpack.